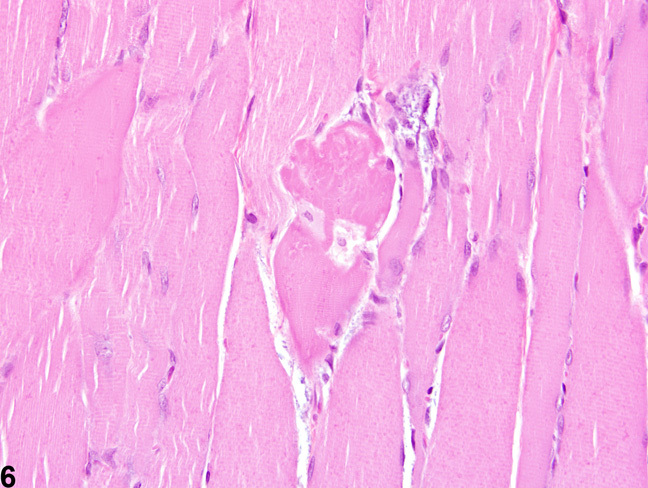 Skeletal muscle-Degeneration in a male Harlan Sprague-Dawley rat from a subchronic study. 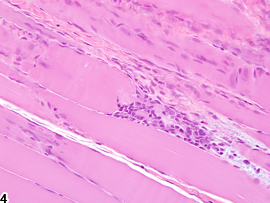 A central myofiber is swollen and hypereosinophilic(arrows), and afragmented segment of another fiber (arrowhead) demonstrates segmental degeneration. Skeletal muscle-Degeneration in a male Harlan Sprague-Dawley rat from a subchronic study. 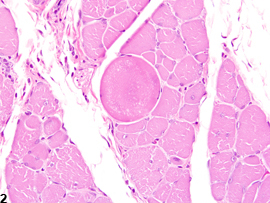 An enlarged, hypereosinophilic muscle fiber with subtle vacuolation is present in an otherwise normal muscle bundle. 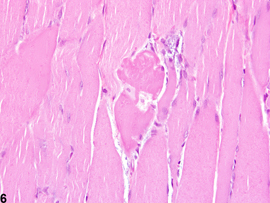 Skeletal muscle-Degeneration in a male Harlan Sprague-Dawley rat from a subchronic study. 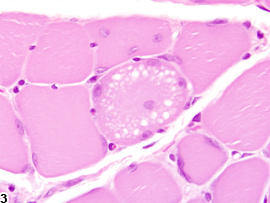 A rounded fiber contains multiple peripheral nuclei, a single internal nucleus, and abundant cytoplasmic vacuoles. 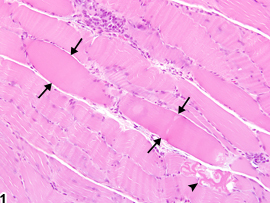 Skeletal muscle-Degeneration in a male Harlan Sprague-Dawley rat from a subchronic study. 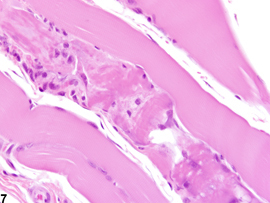 Multiple macrophages and interstitial cells have phagocytized degenerative portions of an enlarged muscle fiber. 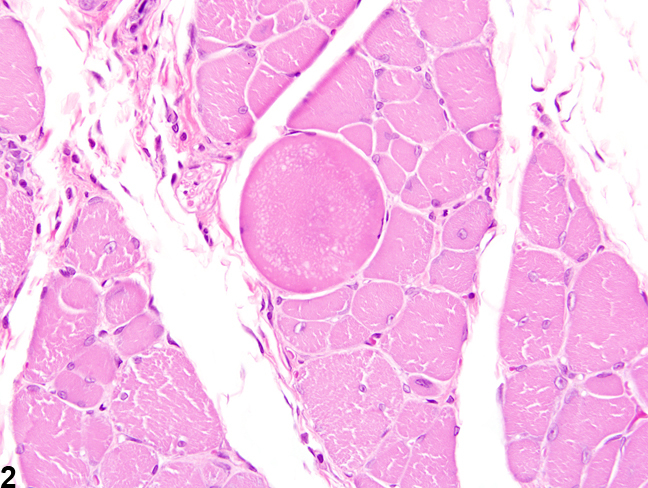 Skeletal muscle-Degeneration in a male F344/N rat from a chronic study. 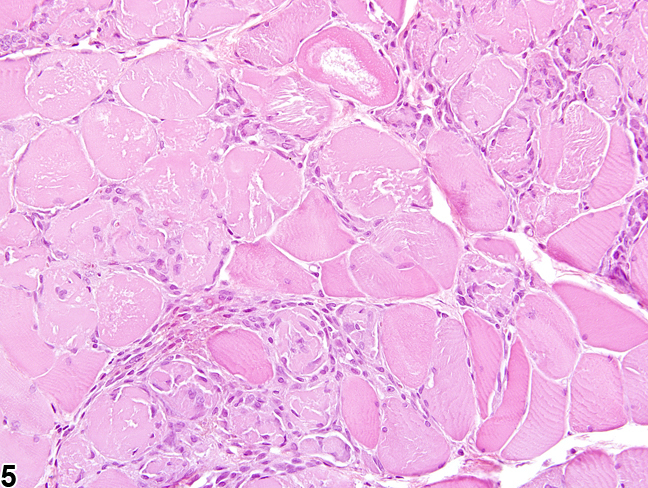 In this cross section of muscle, several adjacent muscle fibers exhibit multiple features of degeneration;increased sarcolemmal nuclei are indicative of an early regenerative response. 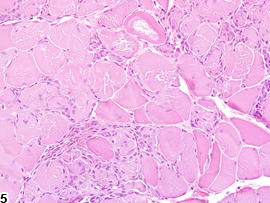 Skeletal muscle-Degeneration in a male Harlan Sprague-Dawley rat from a subchronic study. 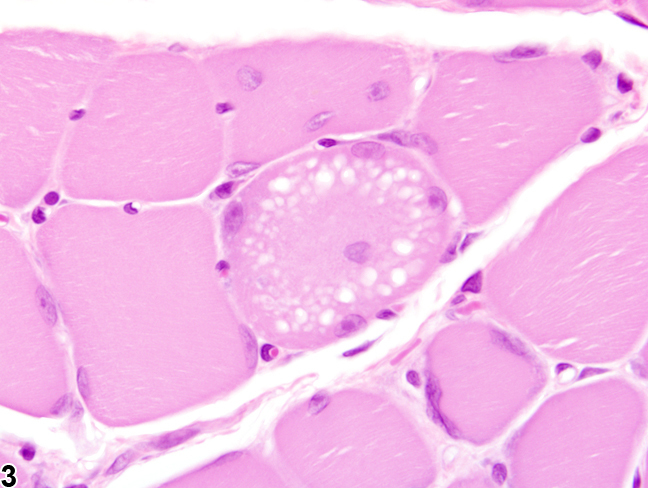 Degeneration is represented by a swollen, hyalinized, and partly fragmented muscle fiber. 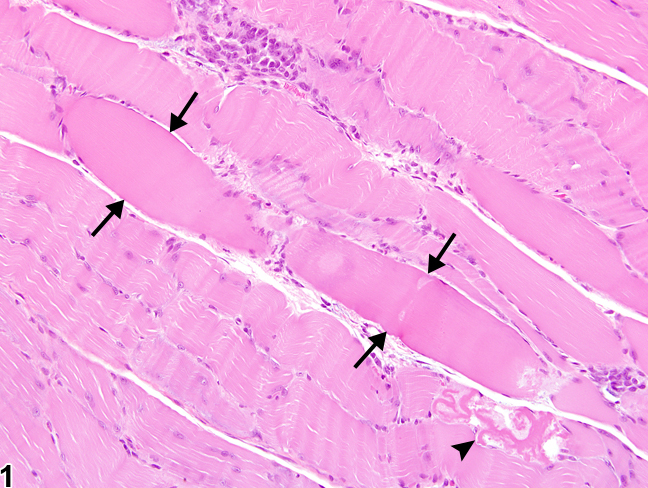 Skeletal muscle-Degeneration in a male Harlan Sprague-Dawley rat from a subchronic study. 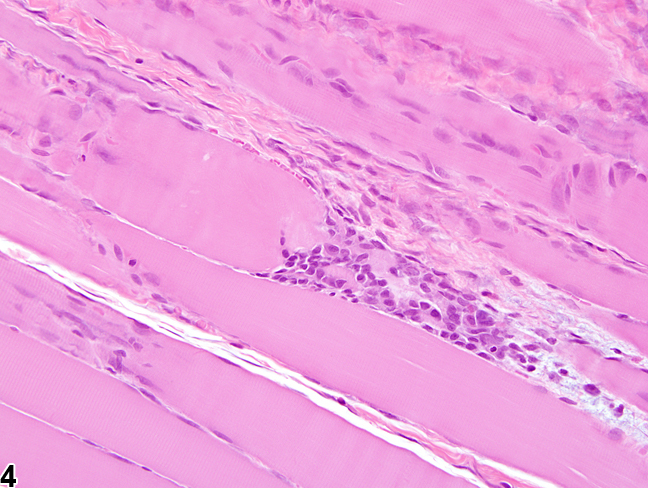 A fragmented and partly hyalinized muscle fiber has lost its striations and is accompanied by early infiltration of macrophages.